Yep, we didn’t think the 550hp Porsche Panamera Turbo S was quite fastest enough either. That’s why we’re relieved that the bods in Stuttgart have just launched this: the new Porsche Panamera Turbo S E-Hybrid, complete with a total output of 680hp. Yikes! 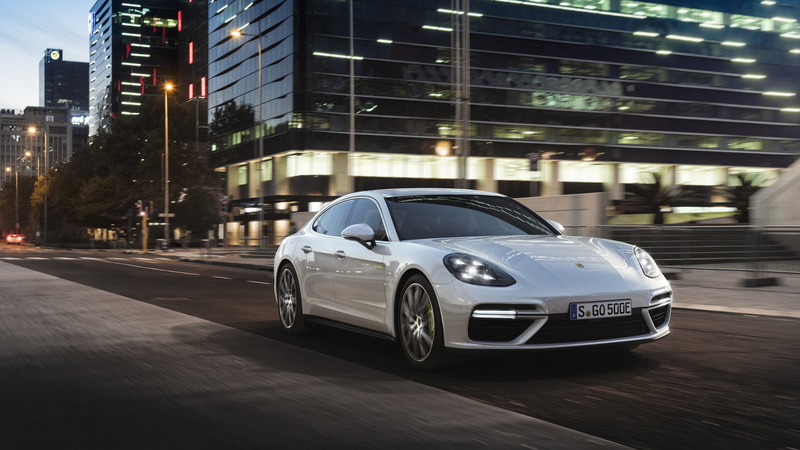 Using the same E-Performance tech as the 918 Spyder hypercar, the Porsche Panamera Turbo S E-Hybrid marks the first time that one of Porsche’s model ranges has been topped by a hybrid offering. 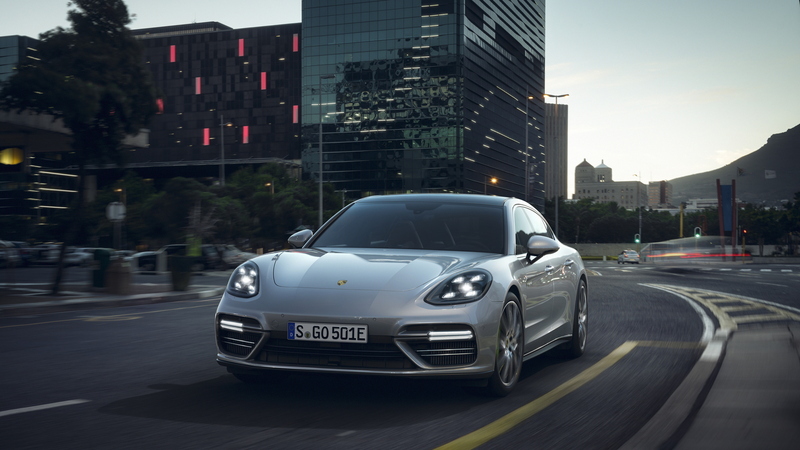 Combining the standard Turbo S’s twin turbo V8 with a 100kW electric motor, the Panamera Turbo S E-Hybrid does the 0-62mph dash in 3.4 seconds (when using the ludicrously effective Launch Control function) before topping out at 192mph. At those speeds, you’ll be chewing through the autobahn in no time, delivering your three passengers to their desired destination in total comfort and well ahead of schedule. While predominantly used to boost performance and reduce fuel consumption and emissions (97.4mpg and 66g/km, in case you were wondering), the Turbo S E-Hybrid also has a range of 31 miles when driven purely on the liquid-cooled lithium ion battery’s juice. The 14.1kWh power pack can be charged fully in six hours by a standard 10-amp connection however, using the optional 7.2kW on-board charger and a 32-amp connection reduces that time to just under two-and-a-half hours. 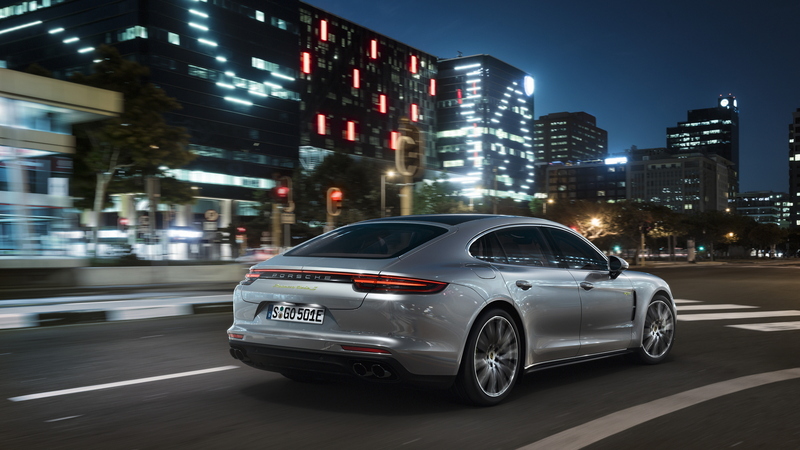 Like the Porsche Panamera 4 E-Hybrid, the Turbo S variant starts up in the purely electric ‘E-Power’ mode, the V8 motor kicking in when a specific pressure point on the accelerator pedal is activated (or the battery drops below a minimum charge level). Like all of Porsche’s Turbo S models, the standard kit list on the new Panamera Turbo S E-Hybrid is extensive: Porsche Active Suspension Management is complimented by adaptive air suspension, while some particularly beefy carbon ceramic brakes are on stopping duty behind the 21-inch alloys. 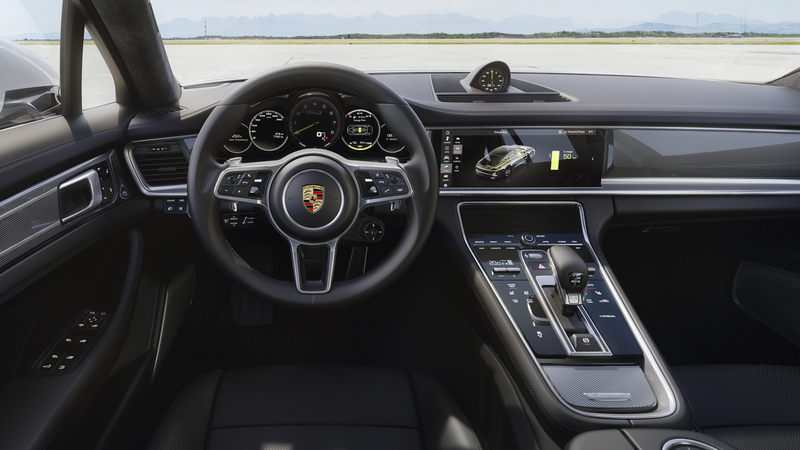 Four-wheel drive (with torque vectoring and traction management) and an eight-speed version of Porsche’s PDK double clutch gearbox ensures that the Turbo S E-Hybrid is ready for all conditions, though it seems unlikely that many will be put to properly rigorous use. While the standard car is pretty expansive, if you’d prefer a little more room in the rear, the new Turbo S E-Hybrid (built on the second-generation Porsche Panamera platform) is also available in a long-wheelbase ‘Executive’ spec, providing an extra 150mm for long legs. Prices start at £137,140 – rising to £146,545 for the long wheelbase version – which may sound steep but there are few cars that we’d rather be chauffeured around in. The first deliveries are expected to UK customers in July.